It was all part Walk and Pedal for the Planet, held Sept. 8 in Fredericksburg, and part of a larger effort, the Global Day for Climate Action. The local event was organized by Fossil-Free Fredericksburg, and meant to raise awareness about global warming and the need to support renewable energy. Friends of the Rappahannock (FOR) volunteers set up an outreach booth and provided drinking water for the rain-soaked attendees. Eva Kerr, 17, is a senior James Monroe High School. She volunteered throughout Walk and Pedal for the Planet and helped with an FOR-led cleanup at Old Mill Park after the event. She said increasing awareness about environmental issues is important to people her age. Dr. Eric Bonds is a professor of sociology at the University of Mary Washington (UMW). He works with Fossil-Free Fredericksburg. The event kicked off with a bike-decorating and sign-making party (with pizza!) 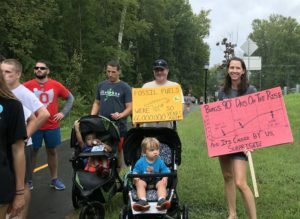 at the Central Rappahannock Regional Library in Downtown Fredericksburg, a couple of days before the Saturday morning bike and hike drew more than 100 attendees to Old Mill Park. Speakers from the Fredericksburg community opened with a discussion of issues related to global warming and renewable energy sources, before the crowd broke into two groups: hikers and bikers. The hikers trekked from Old Mill Park to the FOR office on Fall Hill Avenue, before about-facing for the return trip in a steady rain. The bikers took the same route, but completed the 5K Heritage Trail before returning to the park. Both groups paused at the FOR tent for a brief rest along their way. FOR representatives highlighted ways global warming could affect the Rappahannock River. Community Conservationist Woodie Walker described ongoing FOR projects with UMW faculty, like a migratory songbird count held each spring, that helps scientists understand climate change impacts in the local watershed. Walker said materials provided by UMW biology professors Dr. Andrew Dolby and Dr. Abbie Tomba suggest the most pressing local concerns will involve rising water temperature, changes in riparian corridor habitat, more intense and prolonged drought and flood events, and more contact with invasive species. Hannah Larochelle, 6, rode a scooter, decorated with a sign she made that said, “Love Our Planet.” The word love was represented by a heart. Hannah accompanied her parents, and seemed to enjoy the rainfall as much as her scooter ride. “It poured, which I loved!” she said. Others seemed to enjoy the summer rainfall, too. 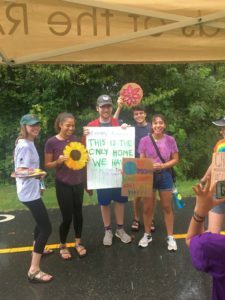 Hannah’s father, UMW professor Dr. Jeremy Larochelle, said students from the school’s Wounded Planet First Year Seminar (FSEM) class, and the Ecovillage living learning community, participated in the event. Sophomore Brenna Creamer is the peer mentor for the FSEM, as well as the co-leader of Ecovillage, and she helped get other students involved. Sisters Ana and Eva Heller joined their parents on bikes for the ride around the trail. 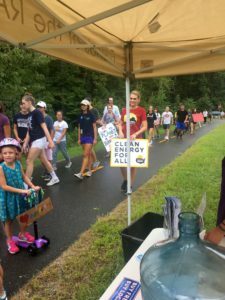 “It was important to me to come out to this event because I am passionate about trying to raise awareness about the environment, and I wanted to show my support for the Fredericksburg Clean and Green Commission,” said Ana Heller, 15, a sophomore at James Monroe High School. Eva, 17, is a senior at James Monroe High. She hopes events like the Walk & Pedal for the Planet inspires more young people to get involved.